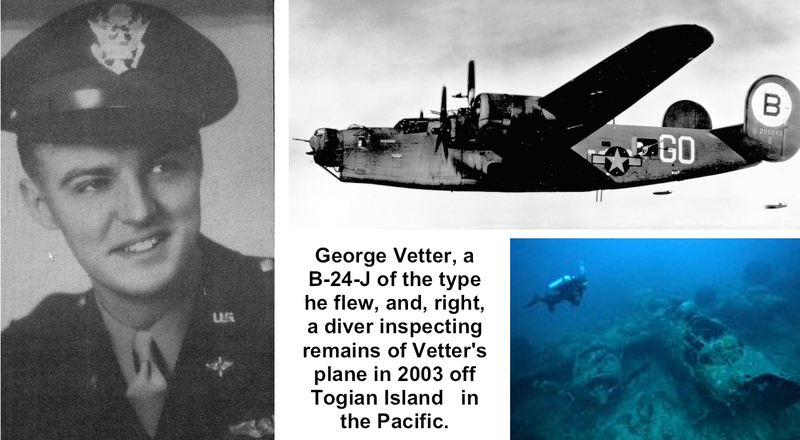 George Vetter survived Japanese anti-aircraft fire, ditching with his bomber in the South Pacific and hiding in an island jungle. But he could not survive the treachery of an island native, and lost his life less than three months before World War II ended. George Otto Vetter Jr. was born in 1923 in New York City. His parents moved to Picketts Ridge Road just across the Ridgefield line in Redding in 1932. George Vetter Sr., a World War I Navy veteran, was the longtime meat manager for the A&P on Main Street in Ridgefield. Because Redding had no high school and the Vetters were so close to Ridgefield (their mailing address was actually “Ridgefield”), George Jr. went to Ridgefield High School, graduating in 1941. He joined the Army Air Corps in 1943 and became a navigator in the Pacific Theatre, flying B-24s. On May 9, 1945, his bomber, nicknamed the “Woody Woodpecker” and bearing nose art of the Warner Brothers cartoon character, took off from Pitu Airfield in what’s now eastern Indonesia to attack Japanese ships near the island of Borneo. The B-24 found its targets in the Makassar Strait. However, while the crew was dropping bombs, the four-engine plane was hit with anti-aircraft fire. Its No. 4 engine lost its oil and fuel pressure and had to be feathered. No. 1 engine was smoking, but still working. Second Lt. Lee R. Dukes, the pilot, managed to keep the aircraft flying at 10,000 feet as crew members jettisoned the remaining bombs, plus every piece of equipment they could get their hands on to lighten the load. However, engine No. 1 shut down, and over the Gulf of Tomini, engine No. 2 began to smoke. Dukes gave the order to abandon the aircraft and all 11 men bailed out at 9,000 feet near the Celebes. All made it safely to either Togian Island or Batoedaka Island. The next day, the Army began searching for the downed airmen, using an OA-10A Catalina, a large amphibious aircraft piloted by Capt. Lloyd Humphreys. The remaining five men had gathered together on a nearby island where they were rescued by natives, who brought them to their village. However, one of the natives apparently told the Japanese about the airmen. The Japanese attacked the village, killing four Americans — including Flight Officer Vetter — and wounding and capturing the fifth. Friendly natives buried the dead Americans in a mass grave. Back home, Vetter’s parents had no idea what had happened to their son, who was listed as missing in action. They would not give up hope, however, and tried every way they could to find information about their son’s fate. They finally contacted a Catholic missionary in the Celebes, who interviewed natives and uncovered the details. Flight Officer Vetter’s remains were eventually found, identified and returned to the United States. He was buried in 1949 in the family plot in a Lutheran cemetery in Queens, N.Y., where his parents are also buried.